Public information and education is a mission of the Conservation District and we focus on more than just youth programs. We host, sponsor, cosponsor, and publicize various workshops, field days, and seminars for local farmers, ranchers, farm managers, wildlife enthusiasts, absentee landowners, women farmers, and more. The best way to stay up to date on the most current events is to follow our Facebook Page (Facebook.com/FranklinCountyConservationDistrict) You can view current posts from our Facebook page on our NEWS page here on the website too. Join us in increasing awareness of how conservation is all around us by participating in our Best Conservation Photography Contest held in conjunction with the Franklin County Fair each July. See PDF below for all the details. No Till on the Plains Winter Conference (late January) Scholarship for FIRST TIME Attendees available; contact our office for scholarship information for the conference. Women Managing the Farm Conference a comprehensive program for farm owners, partners and rookies. Held in mid February each year, this is an event not to be missed! Range Youth Camp (Held each July at Camp Mennoscah in Murdock KS (Kingman County) for high school students entering their sophomore, junior or senior year who are interested in plants, livestock or wildlife. This is a educational event like no other in Kansas! Students will learn range plant identification, plant growth, stocking rates, livestock nutrition, rangeland wildlife management and much more. Scholarships are available for Franklin County students! Contact the Conservation District between Feb 15 & May 1 for scholarship information. Ag Stewardship Workshop (late January /early February of odd years) Check back for information about a 2019 event. This multi County event is held in Overbrook Kansas. Hosted by NRCS, FSA, Conservation Districts, KState Research & Extension and covers current stewardship topics. It’s good for identification purposes at various growth stages of the plants. 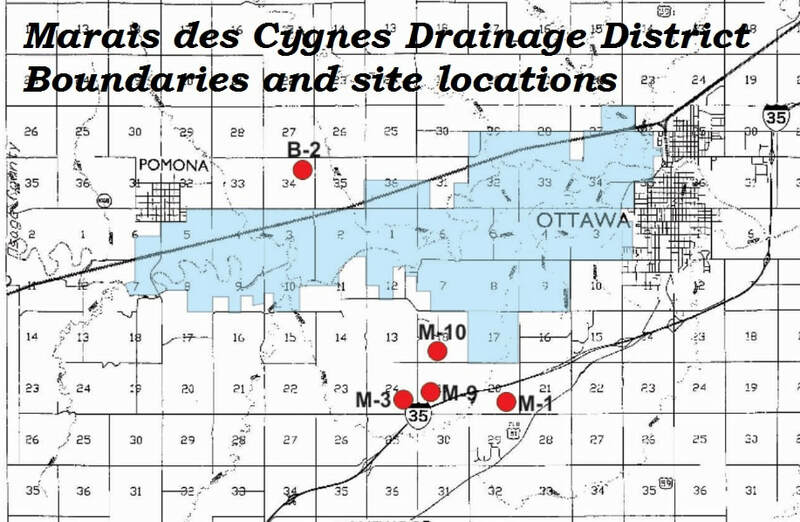 The purpose of the Marias des Cygnes drainage district is similar to that of local watershed districts which is to construct, operate and maintain works of improvement needed to provide for water management within designated boundaries. The drainage district boundaries are shown on the map below. The Marais des Cygnes Drainage District # 1 holds quarterly meetings at the USDA Service Center in Ottawa. Vice President/Treasurer- Roland Bromert and Secretary- Harry Sundstrom. In order to receive a ballot pertaining to MdC DD elections residents within the drainage district boundaries must vote at the Franklin County Court House. "Bold stewardship of resources by the people of Kansas has produced real results" related to the Water Vision. On July 18, 2017 Governor Sam Brownback and Lt. Governor Jeff Colyer announced new findings from the Kansas Geological Survey (KGS) about the life of the Ogallala Aquifer. Traveling to Hoxie and Garden City, KGS unveiled new data showing that stable use of Ogallala Aquifer is attainable. 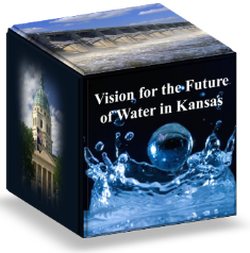 "The data reveals that the voluntary efforts happening as a part of the 50-year Water Vision are being rewarded," said Governor Brownback. "The Ogallala is replenishing itself faster than we previously knew. What was never thought possible is now within our grasp: sustainable use of the Ogallala aquifer is attainable." "Innovative technologies and bold stewardship of resources by the people of Kansas has produced real results," said Lt. Governor Colyer. This is a great moment for water conservation in Kansas, ensuring that Kansas will remain Americas breadbasket for generations to come." Rain Barrels Water Conservation in your own backyard! A rainbarrel is a system that collects and stores rainwater from your roof that would otherwise be lost to runoff and diverted to storm drains and streams. Usually a rain barrel is composed of a 55 gallon barrel, hose, PVC Couplings and a screen to keep debris and insects out. A rain barrel is relatively simple and inexpensive to contract and can sit conveniently under a down spout. Lawn & garden watering may take up to 40% of total household water use during the summer. A rain barrel collects water and stores it for when you need to water plants. According to EPA a rain barrel can potentially save most homeowners about 1,300 gallons of water during peak summer months. See the pdf file below for a brief demonstration on one way to make your own rain barrel. There are also many ideas for rain barrels on Pinterest.